This is a watercolour of the gateway to Magdalen College hall, Oxford. 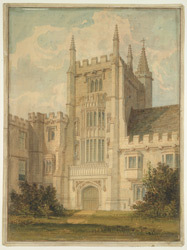 The college was founded by Bishop Waynflete, Bishop of Winchester, in 1458 but work on the buildings did not begin until 1472. This view shows the entrance to the college hall from outside the cloister. The hall, together with the chapel nearby, form the older part of the college, being constructed in 1474. The hall has been largely restored in the early twentieth century, although there is original linenfold panelling in the interior.